THIS article has been steadily working its way up the to-do list for a while – one which marks a major personal landmark, one looked forward to with anticipation and one which heralds a huge change in my life. Rather than looking back on past travels and sharing tales and tips from trips gone by, this post is announcing my biggest, longest and toughest adventure to date. Having crossed Europe, North America, chunks of Asia and the Pacific Ocean, it’s time for a new continent – Africa. And it’s no flying visit. From November until August next year, Africa will be home in by far the most challenging, exciting and, to he honest, nerve-wracking journey of my life. To be more accurate, home for the 10 months will be a huge yellow truck which will carry me and up to 25 other people around the huge continent from north to south, west to east and all the way back up again. Those people are strangers at the moment, some will come and go while others will arrive on sections on the trip, but each will play as big a part in what lies ahead as the places we will visit. And what places. From the moment we come together, with each other and our Oasis Overland truck, in Gibraltar (yes, it’s not Africa but we have to start somewhere), we will head through, deep breath, Morocco, Mauritania, Senegal, Guinea, Sierra Leone, Cote d’Ivoire, Ghana, Togo, Benin, Nigeria, Cameroon, Gabon, Democratic Republic of Congo, Angola, Namibia and the southern point of the route in South Africa. From there it is back up into Namibia and across through Botswana, Zimbabwe, Mozambique, Malawi and Tanzania to Zanzibar and back up through Rwanda, Uganda, Kenya, Ethiopia, Sudan and, finally, Egypt and journey’s end in Cairo. At least that’s the plan, with some extraordinary sights, experiences and optional activities along the way – already booked up for a trek so see mountain gorillas in Rwanda – but you need to be flexible on journeys like this, so what exactly lies ahead will be revealed over the course of 38 weeks. It will be tough at times, there’s no getting away from that. Some long days on the truck in far from ideal conditions, the prospect of having to dig the truck out of sand or mud and 10 months living under canvas. So being unfit, overweight, with a bad back, having waved farewell to 40 in the rear view mirror a few years ago and having not properly camped in decades, there is a simple question. Why? There’s endless reasons not to – money, work, mortgage and, to be honest, common sense – but they are all outweighed by the simple fact it seems the right thing to do. And I want to do it. Travel took over my life four years ago. There’d been a few flirtations with increasingly ambitious trips, but then came the decision to quit my job in journalism and travel overland from London to New York (a tale told elsewhere on this site), followed by a road trip around the eastern USA. The idea was always to do more travelling than just that, but somehow there was a major detour – bizarrely, into working in travel, which involved a lot of time chatting to and helping people looking for that great adventure, which only served to add to the sense of wanderlust. Now, after working in travel in one form or another for the last three and a bit years, including forming a small overland travel firm (currently on hold, but more of that in later entries) alongside a return to journalism, the time seems right to hit the road again. There’s plenty of reasons not to, to put it all off for another day. But who knows what is just around the corner? My father did his National Service as a medic in Singapore and Malaysia. He always said he would return there with my mum when they both retired. But they never got the chance before outside influences intervened and, having lost both of them far too early, that has stuck with me. Having bumped into the guys from Oasis Overland at a trade show, a quick visit to their website was followed by a rather longer one and a couple of very long ones as the thought of climbing on board one of their trademark big yellow trucks took hold and quickly dispelled all counter arguments. So, the decision is made, notice has been handed in at work (albeit the leaving date is not for another seven months), the first of my obligatory to-do lists has been drawn and redrawn and the first bit of kit has been bought. The main task over the next seven months, bar working my way through that to-do list and stopping the kit pile getting too big with my inability not to follow my own advice to pack lightly, is to lose weight and get fit. 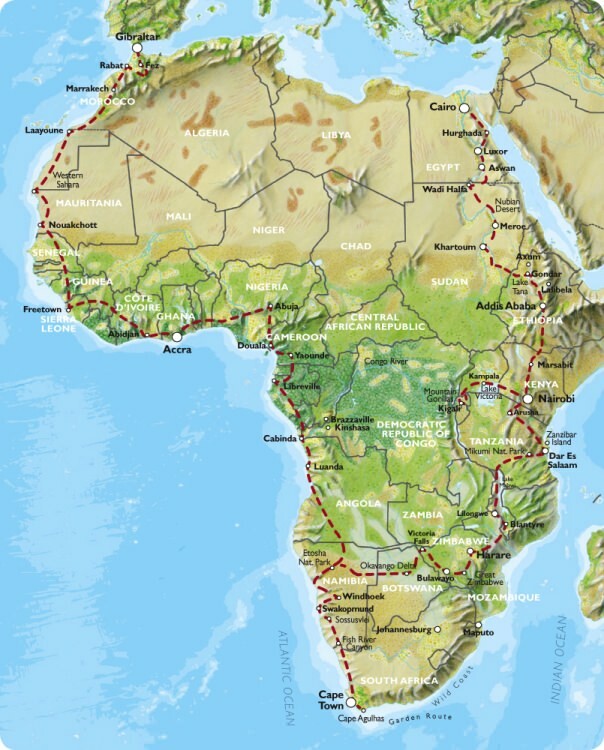 Follow the progress of preparations, getting fit, more details of the trip and, of course, every step of the way around Africa here. IT is somehow apt this trip through my iPod starts, well, almost, with Billy Bragg’s anglicising of Route 66. It popped up at song number six at the start of a road trip of my own, albeit heading west over the Severn into Wales rather than east through Essex, as the journey got off to a flying start through the first 50 tracks. It’s not the last we will see of the Big Nose Bard of Barking – indeed, he popped up later in the opening 50 with Accident Waiting To Happen – as he has been a constant in my music collection from the days of tape decks and Walkmen, through CDs and onto digital. One of the most consistently brilliant live performers, Tank Park Salute is able to reduce me and many other grown men to quivering wrecks. 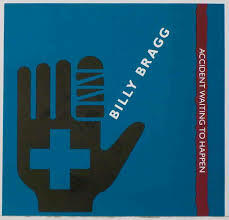 We’ll come back to why Billy is a musical and national treasure in later entries, as well as other acts who will become regular comforts throughout this musical journey – The Smiths (Accept Yourself) and Echo and The Bunnymen (a live version of Action Woman) both popped up as the first of many entries. There was also a first appearance for Nirvana with the MTV Unplugged version of About A Girl – part of the seemingly apt soundtrack which ushered in my 40th birthday stretched out at the back of a converted bus in Seattle – and two from Bob Mould. His Husker Dü days produced Actual Condition, while The Act We Act by Sugar provoked memories of a couple of incredibly loud, remarkably hot and fairly painful gigs. It forms part of the unrelenting opening salvo from the wonderful Copper Blue album – followed by A Good Idea and Changes – with which they opened their set upstairs at a gig above a pub in Birmingham. If the sweat rolling off the ceiling, the unstinting roar from a three-piece band on full throttle and the crowded moshpit was not uncomfortable enough, the twisted ankle from standing on a discarded pint glass in the middle of the moshpit provoked a tactical retreat to the rear. Wonderful night from which my ankle soon recovered. Not sure the same can be said about my ears. Multiple entries also come from The National, a band who have largely passed me by despite rave reviews from friends, and three from Americana legends Lambchop, whose quite beautiful Up With People is currently being played by Mark Radcliffe on 6Music. Never have so many musicians combined so well, so quietly. There was also some songs which came out of the blue, somehow downloaded or burned into my collection but not or rarely listened to. Stumbling across them and heading off to investigate more by the bands involved is one of the key reasons for taking on this challenge – and why it could take a very long time. Falling into this category is About Time by Art Brut, with its opening couplet “There was a time when I couldn’t stomach Morrissey, I thought ‘He can’t have had a hard a life as me’”, and Acoustic Guitar, part love letter to the instrument and part plea for it to bring back the singer’s lost love. One of the tracks from The Magnetic Fields 69 Love Songs – sorry, never managed to plough through all 69 – it also features some great lines, most notably “She always loved the sound of your strum, You made her think maybe I wasn’t so dumb” and “Acoustic guitar, if you think I play hard, Well you could have belonged to Steve Earle”. But one band took over the first section of the list with multiple entries, including the first five tracks – A Day In The Life (twice), A Hard Day’s Night (twice) and A Taste of Honey. They also popped up more than once later on, including three versions of Across The Universe (plus a cover of it by 10cc, who are unlikely to feature again). Which is all a bit strange, not being the biggest Beatles fan. Any music fan needs a working knowledge of their work, hence their presence in my collection, and growing up their songs were fairly constant background music, even when too young to know who they were (had no real idea, aged 10, who John Lennon was when he was shot, but was old enough to know Imagine was, and still is, an awful song). And yes, when they were good they were very good – A Day In The Life, Eleanor Rigby, Paperback Writer and many others – but too many of their songs come perilously close to novelty (Yellow Submarine, When I’m 64 or Lovely Rita Meter Maid for starters). And don’t get me started on Hey Jude. But there’s still a lot of Beatles in my collection, which cannot be said of classical music. In fact, there is just one piece – Samuel Barber’s Adagio For Strings. It wraps up the first 50 tracks on the list and brings back great memories stood on a headland on an island in the middle of the frozen Lake Baikal as the sun set, the perfect soundtrack for a magical moment. A FRIEND heading out on their travels leaves conflicting emotions among those left behind – keen to follow the traveller’s progress and hear a few anecdotes (just a few mind), they know at some point the wanderer will suggest they sit down to see pictures from the trip. Once upon a time it was prints or slides -my childhood was dotted with nights when my bedroom and its giant blank wall became the venue for a meander through the holiday or, even worse, childhood slides – but now digital cameras mean travellers are free to snap away without worrying how many shots they have left on a film. Don’t let any of that put you off snapping away freely. Pictures are a wonderful way of preserving the memories – any long afternoon or evening back home spent flicking through your pictures will instantly return you to those magical moments. If it is ‘a trip of a lifetime’, you want the pictures and memories to last that long. (You won’t see that trip of a lifetime phrase often on this site – it suggests one trip has used up your allocated allowance of travelling, rather than merely being a link in a chain of adventures). So snap away, preserve those memories, but just remember, just show off the pick of the bunch – nobody wants to see six different shots of the same mountain or fountain, no matter how creative and arty you have been. Know your kit – No technical jargon, mainly because it is way over my head. Work out your budget and look around for what is available. You’ll be surprised what you can get your hands on, be it from under £100 to much more expensive. 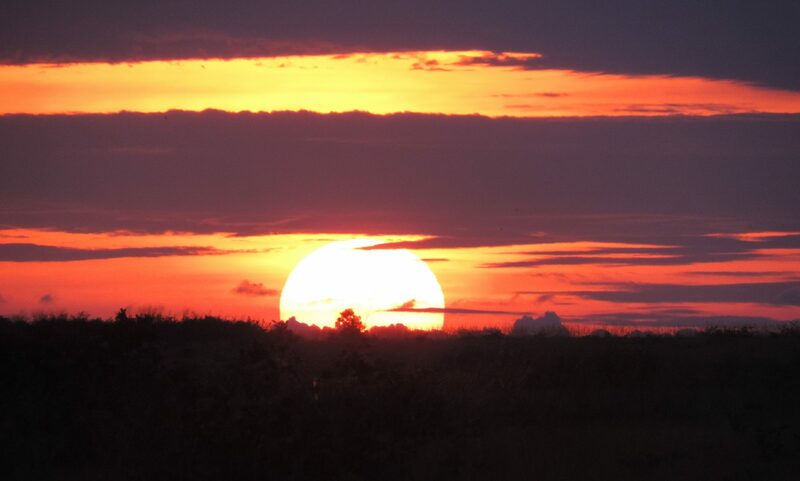 When you’ve got it, take it out and use it before you head off, play around with the settings and learn what it can do – better to find out then than after you’ve missed that great shot in the opening few days. ABC (Always Be Charged) – Apologies to the person who came up with the ABC line, but this is one learned the hard way. Make sure that battery is not going to give out on you, especially if you are heading somewhere power may be in short supply. Otherwise you may find yourself walking back to your camp one night in Denali NP, Alaska, when a moose strolls across your path, only for your camera to remain totally lifeless in your hand. Keep the camera handy – “Not going to take my camera out today, don’t think there’s much point.” Don’t you believe it, keep it with you – it is safer than leaving it back in a hostel – and in some place you can pull it out quickly. You never know when that moose may appear or what lies round that corner. Caption – How’s your memory? Good enough to remember the name of that building, that mountain, that beautiful beach you spent the afternoon on or that girl you met in that bar? Until you’ve got home? Weeks, months, even years later? Chances are it isn’t and you’ll spend ages trying to remember what that statue was commemorating or that fascinating fact the local guide told you about that town square. Keep notes and caption your pics, then you don’t just have your pictures to look back on, but also the tales behind them. Shoot info – You don’t have to remember everything. If something catches your eye to take a picture, look for a sign or plaque explaining what it’s all about and take a picture of it. You can always delete it when you’ve added the caption. Swap shots – If you are travelling with friends or meet people on the way, swap some of your pictures. After all, they are likely to have more pictures of you than you’ve managed to take (and they are likely to be better than selfies). Facebook – The modern equivalent of showing off your holiday pics, with the added advantage you can share them while still out of the country. Don’t throw them all up, just drip feed them onto your status to make your friends jealous (nobody wants to see every meal you ate). It also saves on the postcards. Look for something different – Chances are you’ll find yourself at an attraction which has people queuing up to take pictures from the same classic spot (think the Taj Mahal from the end of the reflecting pool). By all means join in – cliched it might be, but that spot is famous for a reason – but look for some fresh detail or angle that people haven’t seen before. It’s a challenge, but good things rarely come easy. Back-up/Upload frequently – If you are travelling, you normally have time to kill, be it on or waiting for a plane, bus or train. Use the time wisely – write blogs, catch up on sleep and upload your pictures. If you’ve got space, you don’t have to wipe them from your memory card, but if you load them onto your laptop, an external hard drive and a picture storage account such as Flickr or Picasa, you’ve got added security (Facebook is also useful for that). Little and often means you don’t spend hours waiting for a load of pictures to upload via a slow internet connection when you could be out taking more shots of whichever stop you’ve reached. Don’t leave camera unattended – Common sense really, if just for the security. But anyone leaving their camera alone on a night out may be surprised what they find when they next check it. BEFORE the travel bug really bit, my natural habitat was a newspaper office (or the pub, the customary watering hole for the journalistic wildlife in the days when regional newspapers actually printed on the date which adorn the front). Chunks of time were spent wrestling with copy from reporters, freelances and contributors to ensure it was grammatically correct, readable or shoehorned into house style (often all three). Over the years, several pet peeves emerged that were guaranteed to spark prolonged grumbling if they ever appeared in copy. Overuse of the words that and ever, without even mentioning the fact that apostrophes and commas don’t appear to be taught nowadays (leaving them all out or putting in so many some of them must be right are not the best way to please a sub-editor, a dying, much-neglected breed). Sadly, many of those annoyances resurface reading travel blogs. If it is a personal blog, designed purely to capture your trip for posterity, there is very little wrong with that – it is your trip, your blog, your rules. But if you want anybody else to read and enjoy your blog, it is worth following a few rules. One tip amid his advice certainly rang true – the advice to avoid using the first person. It is said the cricket writer and commentator John Arlott never used the word ‘I’ in his entire written works. Having tried very hard to write this piece working to the same rule, it is extremely difficult. Damn, so nearly did it. SOUNDS simple, doesn’t it? Plug the headphones into my iPod, turn it on and listen to all the songs in alphabetical order. All 11,235 of them… and rising. As far as challenges go, it is not the toughest. It’s hardly walking to the South Pole, scaling Everest or even a marathon. This is just me and two constant companions – my ipod and laptop – heading off on a journey which, at an average of an hour a day, will take just over two years, but is likely to last considerably longer. My iPod decides the order – It’s in-built alphabetising system is the one which will determine the running order. Strangely, it has changed with Vampire Weekend’s A-Punk relegated from the opening track to somewhere in the pack of A songs. Some of the alphabetising is a bit weird, especially with definite and indefinite articles. No skipping – To count, the song must register as having been played in my iTunes library, which means playing it until the end. Long silences at the end of songs are likely to push my patience on this one. It’s the tracks that count, not songs – Multiple versions of the same song all have to be listened to. The most found so far is five – one cover and four of the original in various different guises. That’s five tracks to be listened to all the way through. So that’s what and how, but why? Must admit, did try this a few years ago – albeit on a much smaller iPod – and was very dutiful until hitting the Cs and somehow never quite managed to pluck up courage to tackle the whole five-part Cassandra Gemini suite by The Mars Volta and it somehow never picked up again. It was fun while it lasted though, with some forgotten treasures and previously unheard tracks – downloaded and never listened to – popping up as great surprises. Anthem For A 17-Year-Old Girl by Broken Social Scene certainly falls into that category and became a constant on playlists for some time afterwards. There’ll be plenty more forgotten gems, unheard tracks and ones which prompt head scratching as to what they are doing on the iPod in the first place. And it is these discoveries, plus the tales and memories they evoke and the background to the challenge which will form the basis of this blog.